The research team found a threefold increase in Acanthamoeba keratitis since 2011 in South-East England. Reusable contact lens wearers with the eye infection are more likely to have used an ineffective contact lens solution, have contaminated their lenses with water or reported poor contact lens hygiene, according to the findings published today in the British Journal of Ophthalmology. “This infection is still quite rare, usually affecting 2.5 in 100,000 contact lens users per year in South East England,* but it’s largely preventable. This increase in cases highlights the need for contact lens users to be aware of the risks,” said the study’s lead author, Professor John Dart (UCL Institute of Ophthalmology and Moorfields Eye Hospital NHS Foundation Trust). Acanthamoeba keratitis is an eye disease that causes the front surface of the eye, the cornea, to become painful and inflamed, due to infection by Acanthamoeba, a cyst-forming microorganism. The most severely affected patients (a quarter of the total) have less than 25% of vision or become blind following the disease and face prolonged treatment. Overall 25% of people affected require corneal transplants to treat the disease or restore vision. Anyone can be infected, but contact lens users face the highest risk, due to a combination of increased susceptibility to infection, for reasons not fully established, as a result of contact lens wear and contamination of lens cases. The researchers collected incidence data from Moorfields Eye Hospital, from 1985 to 2016. They found an increase dating from 2000-2003, when there were eight to 10 cases per year, to between 36-65 annual cases in the past few years. As Moorfields treats more than one in three cases of the disease in the UK, the researchers expect their findings are relevant to the UK more broadly. 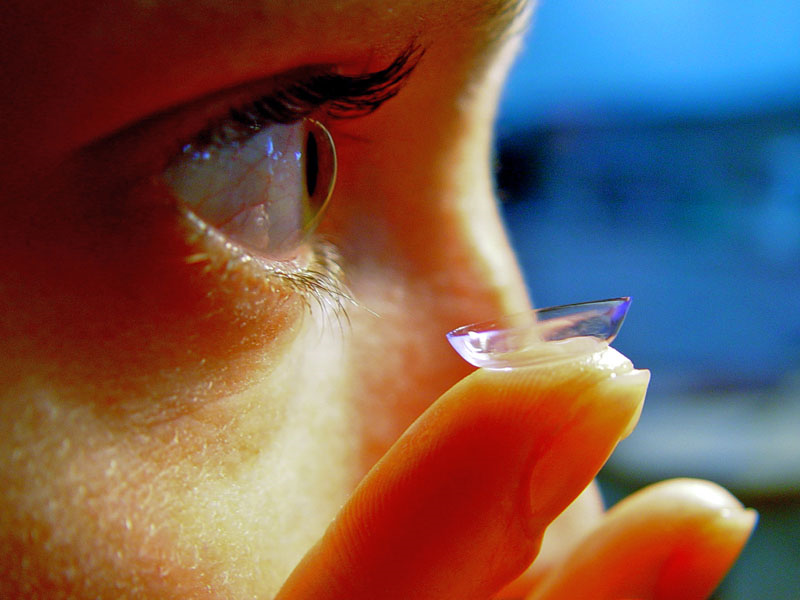 Alongside these findings, they conducted a case-control study of people who wear reusable contact lenses on a daily basis (although the disease is also associated with disposable lenses), comparing those who had a diagnosis of Acanthamoeba keratitis to those who had come in to Moorfields A&E for any other reason, from 2011 to 2014. The case-control study included 63 people with Acanthamoeba keratitis and 213 without. They all completed a questionnaire, from which the researchers found that the risk of developing the disease was more than three times greater amongst people with poor contact lens hygiene, people who did not always wash and dry their hands before handling their lenses, those who used a lens disinfectant product containing Oxipol (now phased out by the manufacturer), and for people who wore their contacts while in swimming pools or hot tubs. Showering and face washing while wearing contact lenses are also likely to be risk factors. Acanthamoeba is more commonly found in the UK than in other countries, likely due to higher levels found in domestic (as opposed to mains) water supplies, so that water contamination of contact lenses is of particular concern in the UK. The researchers say the current outbreak is unlikely to be due to any one of the identified risk factors in isolation. “People who wear reusable contact lenses need to make sure they thoroughly wash and dry their hands before handling contact lenses, and avoid wearing them while swimming, face washing or bathing. Daily disposable lenses, which eliminate the need for contact lens cases or solutions, may be safer and we are currently analysing our data to establish the risk factors for these,” said Professor Dart. “We now need to share this information as widely as possible with clinicians, contact lens practitioners and contact lens wearers, a strategy that has proved effective in the past in decreasing the incidence and burden of this severe eye infection,” said first author Dr Nicole Carnt (University of New South Wales, UCL Institute of Ophthalmology and Moorfields Eye Hospital). “This research confirms what those of us affected by Acanthamoeba keratitis have suspected for some time: that incidences of this awful, life-changing infection are on the increase, and there’s more that should be done to prevent people from losing their sight to Acanthamoeba keratitis,” said Irenie Ekkeshis, who is part of Acanthamoeba Keratitis Patient Support Group UK, led by Dr Carnt. The study was funded by Fight for Sight, Moorfields Eye Charity and CooperVision UK alongside support from the NIHR Biomedical Research Centre at Moorfields Eye Hospital NHS Foundation Trust and the Australian National Health and Medical Research Council. *A 2002 study estimated the prevalence in South-East England to be 2.5 in 100,000 contact lens users (Radford, Minassian et al. 2002), while the researchers estimate the prevalence to be two to three times higher at present.